Airbnb is a privately owned accommodation rental website which enables hosts to rent out their properties or rooms to guests who use the website to find somewhere to stay. The company began in 2007 when roommates Brian Chesky and Joe Gebbia started AirBed & Breakfast on the living room floor of their San Francisco apartment. The friends provided three air mattresses and homemade breakfast to guests who were unable to find alternative accommodation in the city. In 2008, Nathan Blecharczyk joined AirBed & Breakfast and Airbedandbreakfast.com was launched (the website name was shortened to Airbnb.com shortly afterwards). In 2011, the company started its overseas expansion, opening its first international office in Hamburg, Germany. Airbnb, which generates its revenue through service fees to hosts and guests, was valued at 31 billion U.S. dollars in May 2017. For many of the guests who use it, Airbnb can offer cheaper alternatives to paying for a hotel room. In the company’s hometown of San Francisco, for example, the average daily rate of a stay in an Airbnb property was 18.8 percent less than the average daily rate of a hotel in 2015. While Airbnb may have enjoyed growing success since it started back in 2008, the company has also endured a number of scandals involving theft, property damages and an array of sordid activities in hosts’ apartments. As well as this, the company has experienced issues with taxes and regulations, particularly in New York City where the occupancy rate of Airbnb properties was around 65 percent in the summer months of 2015. In New York City, Airbnb generated an estimated revenue of 451.43 million U.S. dollars in that year and this was forecasted to reach 805.32 million U.S. dollars by 2018. 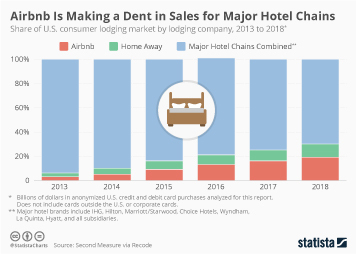 Airbnb ad spend in the U.S.
Hotel industry in the U.S.
5. Market in the U.S.
Topic: Travel and Tourism in the U.S.
More interesting topics from the industry "Accommodation"